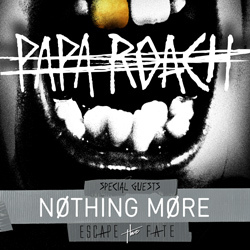 On April 5th, Papa Roach head out on the final North American headlining leg of their Crooked Teeth World Tour. Today, the band releases a surprise music video for "None of The Above", the eighth music video released from their latest album Crooked Teeth. The video, which was shot on location at Beaufort Castle in Luxembourg while the band was on tour in Europe, features the DanceXperience ballet troupe. It was directed by Bryson Roatch and choreographed by esteemed urban dance choreographer Alex Lopes. "We actually wrote 'None of The Above' near the end of recording Crooked Teeth," says bassist Tobin Esperance, "We were going for a classic rock-sounding anthem, juxtaposed with current, contemporary, sounds and taking a rock anthem to a younger generation. Bryson had this great idea of going to a castle while we were on our European tour and then he made us even more excited by telling us that he could get this song choreographed and he delivered on all counts." "We wanted to create something you would not normally see from a rock band," says director Bryson Roatch, "It was amazing and such an honor to work with other artists from a different culture and see their passion." Papa Roach set out to push the boundaries of their genre with their ninth studio album, Crooked Teeth. Released in May 2017, the album debuted in the Top 20 on the Top 200 Albums Chart as well as at #1 on Billboard's Top Hard Rock Albums Chart, accumulating over 200 million streams worldwide. Crooked Teeth earned Papa Roach two #1 singles on Billboard's Mainstream Rock Chart with the lead single "Help" reigning atop the chart for six straight weeks as well as "Born For Greatness", which has been prominently featured on top Spotify playlists such as "Rock This" and "Beast Mode" and can be heard weekly as the theme song for WWE's Monday Night Raw. Over the last sixteen months, Papa Roach have taken the Crooked Teeth experience global - touring extensively throughout Europe, Australia, North America and South America. The band just wrapped up a successful run with A Day to Remember on the 15 Years in the Making Tour where they played to 100,000 fans over the course of eighteen shows. Papa Roach is ready to bring even more of their headlining might to intimate venues in North America featuring support from Nothing More and Escape the Fate. Tickets are selling fast, with five sold-out shows on the leg, and eight more with limited tickets remaining. For more information, visit www.paparoach.com.